Low inflation leads to slight increases for top income tax rate and estate tax exclusion, but higher deductions for eligible long-term care premiums. While there are efforts in Congress to reform the Internal Revenue Code, and presidential candidates from both parties are calling for changes in the IRC, including shifts in the income tax brackets and an end to the federal estate tax, advisors and their clients must use the current tax code to plan. The Internal Revenue Service announced Wednesday its annual inflation adjustments for more than 50 tax provisions for tax year 2016. The adjustments, detailed in IRS Revenue Procedure 2015-53, are muted because of the tempered inflation rate in 2015. The 39.6% top income tax rate will be levied on single taxpayers whose income exceeds $415,050, or $466,950 for married taxpayers filing jointly, up from $413,200 and $464,850, respectively (see full chart below). As Alison Bell writes in her story on the deductions on ThinkAdvisor’s sister site, LifeHealthPro, the IRS will increase the individual LTCI premium deduction limit a little more for purchasers in their 40s in 2016 than for purchasers in other age groups. Federal law makes an LTCI deduction available to consumers who have enough medical bills to itemize their medical expenses. To itemize, consumers must have eligible expenses not covered by health insurance that exceed 10% of their AGI. The standard deduction for heads of household rises to $9,300 for tax year 2016, up from $9,250 for tax year 2015. Other standard deduction amounts—$6,300 for singles and married persons filing separate returns and $12,600 for married couples filing jointly—remains unchanged. The limitation for itemized deductions begins with incomes of $259,400 for single filers and $311,300 for married couples filing jointly. The Alternative Minimum Tax exemption amount is $53,900 and begins to phase out at $119,700 ($83,800, for married couples filing jointly for whom the exemption begins to phase out at $159,700). The 2015 exemption amount was $53,600 ($83,400 for married couples filing jointly). 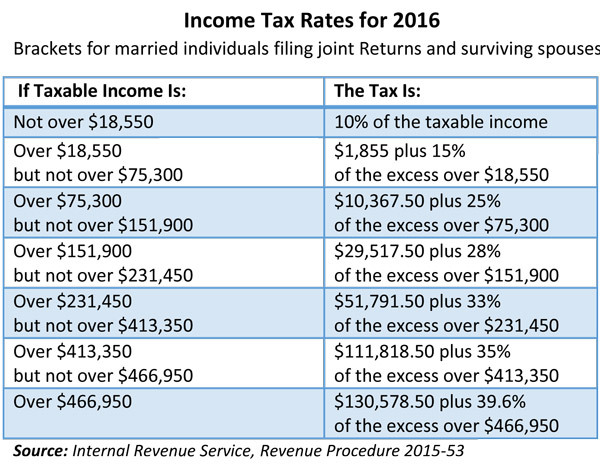 For tax year 2016, the 28% tax rate applies to taxpayers with taxable incomes above $186,300 ($93,150 for married individuals filing separately). For participants who have self-only coverage in a Medical Savings Account, the plan must have an annual deductible that is not less than $2,250, up from $2,200 for tax year 2015; but not more than $3,350, up from $3,300 for tax year 2015. For self-only coverage the maximum out-of-pocket expense amount remains at $4,450. For tax year 2016 participants with family coverage, the floor for the annual deductible remains as it was in 2015 – $4,450 – but the deductible cannot be more than $6,700, up $50 from the limit for tax year 2015. For family coverage, the out-of-pocket expense limit remains at $8,150 for tax year 2016 as it was for tax year 2015. The AGI amount used by joint filers to determine the reduction in the Lifetime Learning Credit is $111,000, up from $110,000 for tax year 2015. The foreign earned income exclusion is $101,300, up from $100,800 for tax year 2015. Estates of decedents who die during 2016 have a basic exclusion amount of $5.450 million, up from a total of $5.430 million for estates of decedents who died in 2015. In calendar year 2016, the first $14,000 of gifts to any person (other than gifts of future interests in property) are not included in the total amount of taxable gifts made during that year.